I seen a similar recipe the other day while browsing online and it seemed like it might be worth a try. The local store had some good prices on chops so I grabbed a few and whipped this up. 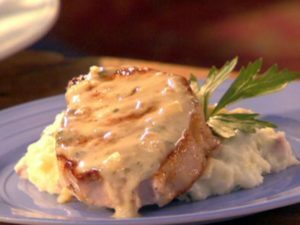 I thought it was pretty easy and has a ton of flavor that is different from the usual pork chops you find in restaurants. In a large skillet, melt Margarine and fry the Celery, Onion and a few cloves of Garlic for about 5 minutes. Remove from pan and set aside. Pan fry Pork Chops for 2-3 minutes on each side, just enough to brown them. Add Water, cover and simmer for 30 minutes until meat is cooked throughout. Combine fried Celery with Soup and Milk, whisk thoroughly. When Pork Chops are cooked, set aside and add Soup mix to pan. Simmer about 5 minutes making sure to stir constantly. Pour over Pork Chops and serve. 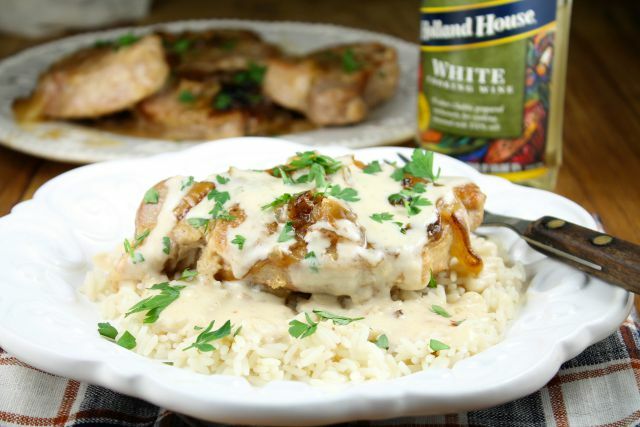 You can make some rice for on the side and cover that with the celery sauce as well. The sauce goes great with stir-fried vegetables as well.